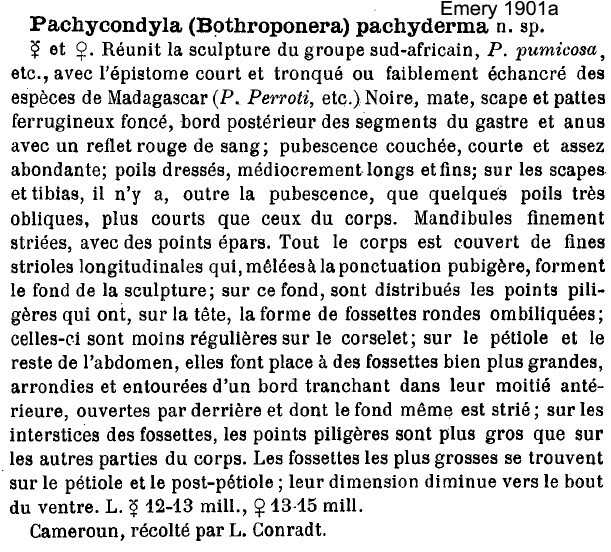 Type location Cameroun (Pachycondyla (Bothroponera) pachyderma n. 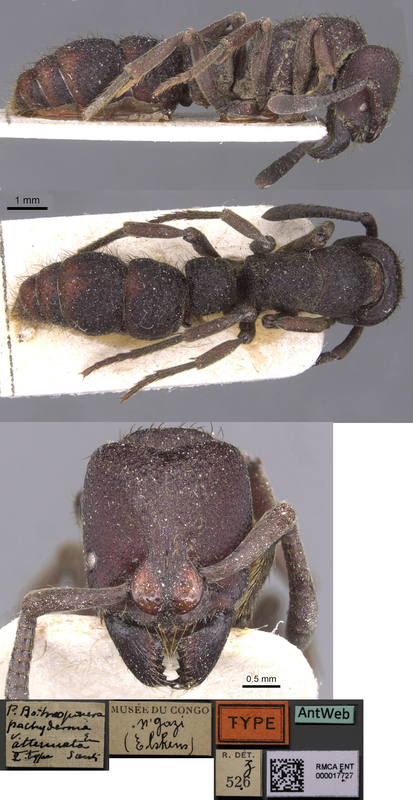 sp., Emery, 1901a: 49, worker & queen; as Bothroponera pachyderma (Emery), in Wheeler, 1922: 73) collected by Conradt - no images on Antweb (June 2014). attenata (Pachycondyla (Bothroponera) pachyderma Em, var. attenata n. var., Santschi, 1920b: 7, worker; note spelt attenuata by Santschi, 1933b) from Za飏e, N'Gaza, Elskens - see below. funerea (Bothroponera pachyderma variety funerea new variety, Wheeler, 1922: 73, delate queen, see below) from Za飏e - no images on Antweb (June 2014). postsquamosa (Pachycondyla (Bothroponera) pachyderma Em, var. postsquamosa n. var., Santschi, 1920b: 7, worker) from Congo, Lobaye, Reichensperger - no images on Antweb (June 2014). worker and queen described (see Bolton, 1995, in Pachycondyla, status revived Schmidt & Shattuck, 2014: 76) . Emery's (1901a) description is at . Santschi's (1920b) descriptions of attenata and postsquamosa are at . WORKER - TL 12-15 mm; mandibles striate; antennal scapes not reaching to occiput; eyes small; petiolar node sharply truncated posteriorly; black or brownish black; golden pubescence less pronounced than in talpa; sculpture coarser. Wheeler (1922) noted "all the specimens, both workers and females, have a blood-red, subtriangular spot at the middle of the posterior border of each gastric segment. I regard Santschi's B. sculpturata, described from a female, as synonymous with Emery's pachyderma". He added how the workers were found "under a log. When it was lifted the ants feigned death". Described as widespread in the Ghana semi-deciduous forest zone, from leaf litter sampling, by Belshaw & Bolton (1994b) but, although found at seven sites, only 16 workers were collected (1992). 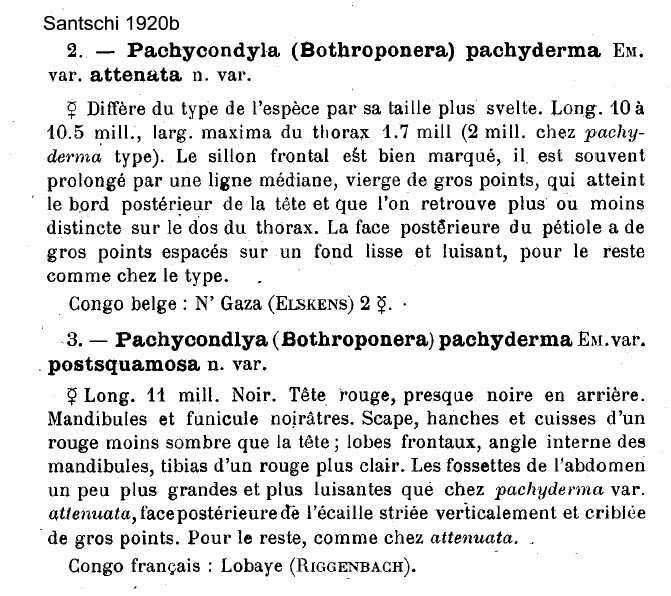 L関ieux & Diomande (1978) in their description of the activity of Pachycondyla sennaarensis, mention this species as found at Ferk閟s閐ougou in the Ivory Coast sudan savannah zone. The photomontage of a syntype worker of attenata is collated from http://www.antweb.org/specimen.do?name=rmcaent000017727. The photomontage is of a worker from the Central African Republic, Dzanga-Sangha NP, Camp 1; collector Philippe Annoyer (CAR JP). The photomontage is of a queen from Congo, R閟erve de L閟io-Louna; collector Eric Zassi (t 2.1). Note the specimen shown on Antweb as Pachcondyla pachyderma [http://www.antweb.org/specimen.do?name=sam-hym-c007963&shot=p1&project=] , identified by W L Brown, clearly is Pachycondyla sanguinea and I have moved the record to the latter.